The City of Baltimore will be hosting the first Light City celebration from March 28-April 3, 2016. Experience light, music and innovation at this unique festival of lights downtown, just a few minutes from the 1840s Carrollton Inn and Plaza. Baltimore was the location of the first public demonstration of gas lighting. In 1816, Rembrandt Peale, a member of the Peale Museum family, amazed patrons with his way of lighting a room of paintings–gas lights without wicks, oil or smoke. His house became the first in the city to be lit with gas lighting, and Baltimore became the first in the country to be illuminated by gas lights. 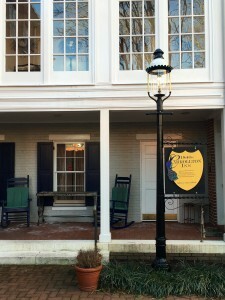 This gas lamp is stationed outside of the 1840s Carrollton Inn to greet guests just as the historic lamps greeted visitors to Baltimore. The first gas lamp was erected by the Gas Light Company of Baltimore (now know as Baltimore Gas and Electric, or BGE) at the corner of Market nad Lemon streets, now Baltimore and Holliday streets. This is just a few blocks from the 1840s Carrollton Inn and Plaza, but you don’t have to walk that far to see an authentic gas lamp! We proudly host a gas lamp in our courtyard, just a few steps from the inn. Now 200 years after the first gas lamp illuminated Baltimore’s streets, the city is hosting the first celebration of the historic creativity that happened right here in our city by bringing back the innovation through a festival of light, once again to light the streets of Baltimore in a new and exciting way. The BGE Light Art Walk takes you on a colorful trip around the Inner Harbor. The walk is about 1.5 miles of different exhibits of light, music and food. Take a ride on an LED Ferris wheel or the Charm City Carousel, participate in unique presentations and experience some of the best and most innovative lighting displays in the world, including dioramas, a labyrinth, illuminated structures and more! as well as youth conferences. Stay at the 1840s Carrollton Inn to be just steps away from the excitement of Light City Baltimore. Music will be filling the streets with performances from exciting artists. There will be food and drinks all throughout the BGE Light Art Walk at certain bars and restaurants. Restaurants throughout the city are also offering specials for Light City, including in Little Italy. The entire city is gearing up for this exciting new festival that will celebrate the innovation and creativity of Baltimore. What better way to do that than through a colorful light showcase? This festival will be an experience unlike any other and it is happening right in our own backyard. 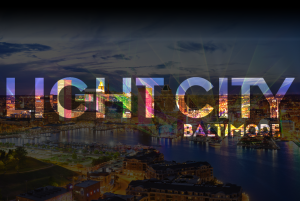 Visit the website of Light City Baltimore to get more information on attending the festival and schedule of events. For easy access during the festival, Light City also has a free app available for download for Apple and Android devices. Simply type in “Light City Baltimore” in the search bar in your app store to download. The map and schedule of events are available through the app. Come join us in celebrating this historic anniversary and book your room at the 1840s Carrollton Inn, just a short stroll from Little Italy and the heart of Light City.